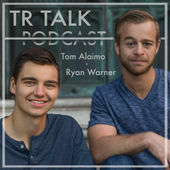 If you missed it yesterday, my friend Ryan Warner and I released our first podcast. I’ve been listening to podcasts more and more in the last year. Regardless if your interest is in business, sports, history or otherwise, there is no shortage of tremendous content. That said, we thought there was a hole in the market for a podcast run by Millennials, for Millennials that focused on how people of our age can break out of the negative stigma. On TR Talk, we interview leaders in their respective fields to learn how millennials can make an impact in today’s workforce. The goal here is to gain some practical knowledge from people that we admire and can add a lot of value to our audience. For episode 1, we interviewed Rich Stone, VP Sales at TechTarget, titled “Attitude is Everything”. Rich was a great guest and gave us his perspective on how millennials can win through mental preparation, social selling and more. We have some great guests lined up and are fired up to bring this to everyone. We’re looking to post every other week.